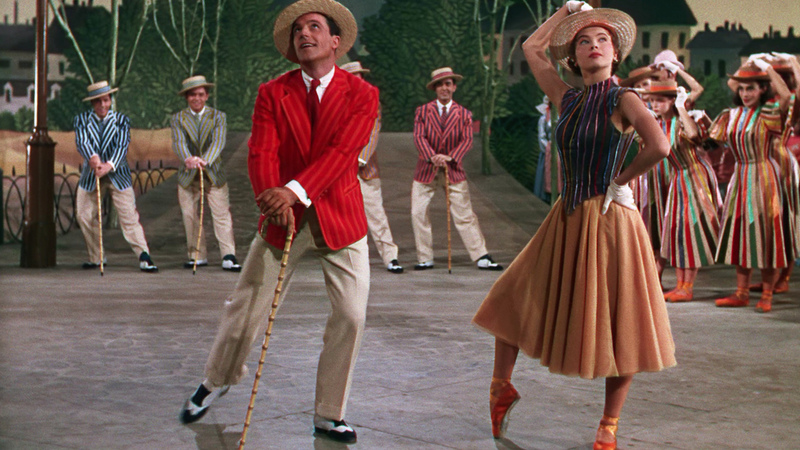 Friday marks the 22nd anniversary of the death of Gene Kelly and in honor of the talented song and dance man I wanted to share the five movies of his I think he excels at. Of course this list is subjective so feel free to include your favorites in the comments. Is it cliche to include his indomitable performance as romantic hero Don Lockwood in this quintessential musical classic? Hell yes. Do I care? Hell no. 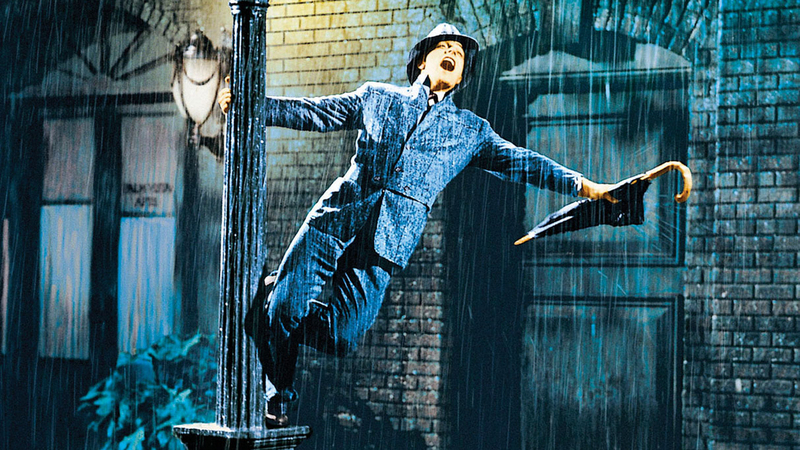 This is the Gene Kelly performance that trumps them all and rightfully so. As Don Lockwood, the man whose mythology is self-invented, Kelly showcases what made audiences love him and Hollywood. He’s a self-starter who can pitch woo as good as he can take a punch on the jaw. His singing and dancing is exemplary, and when no one believed an audience would sit through an unspoken ballet, he championed it (we’ll see this play out as well in another performance on this list). I adore everything about his performance, from his interactions with the squeaky-voiced Jean Hagen to his wordless chemistry with Cyd Charisse (though I still have trouble forgiving him for making Debbie Reynolds cry). It’s a performance that you’d expect from a list of Kelly’s greatest, but oh, how great it is! Gene Kelly’s Tommy Albright in this 1954 adaptation of the musical by Allan Jay Lerner is the picture of the hopeless romantic. His trip to Brigadoon is filled with magic yet it comes with the knowledge that his love for Fiona Campbell (Cyd Charisse again) is doomed. Or is it? (It’s a Hollywood movie so you should know the answer.) It doesn’t give Kelly his meatiest role, but what I love about Kelly as a performer is his ability to exude romance for women and machismo for men, yet he can cross both streams to appease all genders. Here, in Brigadoon, his confidence attracts all the residents of the town, yet his love for Fiona is singular. I have a soft spot for Xanadu in general, but Gene Kelly is the perfect element of Old Hollywood glamour this is bizarre ’80s musical needs. He lends it legitimacy as Danny McGuire, a possibly, though never made clear, connection to his previous role in the Rita Hayworth film Cover Girl (1944) – which is strange because Xanadu itself is a remake of the Rita Hayworth film Down to Earth (1947). Regardless, Kelly’s Danny finds himself reminiscing over a woman he met during the war, played here by Olivia Newton John. He gets a chance to show he could still sing and dance at over fifty years old. He has sweet chemistry with ONJ and the man decides to open a roller disco! That’s impressive. If you read my initial review and/or listened to the episode of Ticklish Business I did, then you know I’m not big on An American in Paris. That being said, I love Gene Kelly’s performance as Jerry Mulligan. Though, considering how much of himself Kelly put into the film as choreographer, this movie features him beyond mere actor. The sets are ambitious, the dances are amazingly impressive, and that’s all Kelly’s doing. An American in Paris is the perfect encapsulation of Kelly’s talents as both actor, director and choreographer. 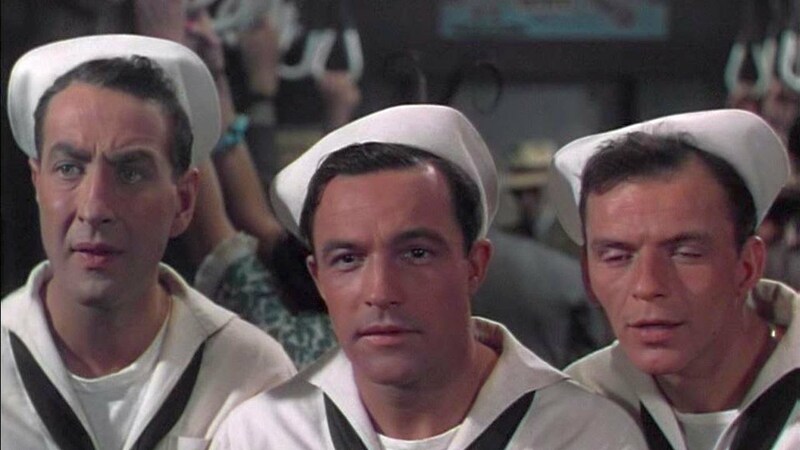 I can’t say too much about On the Town in regards to Kelly’s performance, short of it being pure Gene Kelly. He’s adorable as the lovelorn Gabey on the hunt for Vera-Ellen’s “Ms. Turnstiles.” Really, I think the film works best as a collaborative effort with all the performers. I just really needed a fifth film. Like what you’ve read? Consider supporting the site by buying me a coffee! He certainly had a way about him, did our Gene. Christmas Holiday, What a Way to Go!, and It’s Always Fair Weather would make my short list of great Kelly performances. I’ve had It’s Always Fair Weather on my Warner Archive queue for ages. Really need to see it! On the Town is my favorite Gene movie, and my all-time favorite musical. I just never tire of watching it. I can put it on at any time and have a ball with it. Also, I’m so glad to hear I’m not the only person who appreciates Xanadu, lol! As many of his films as I’ve seen, and as much as I wish differently, I just can’t claim to be a Gene Kelly fan. I wish I knew why. He just doesn’t appeal to me for some reason, even with all that talent. I can understand that – I’ve documented in-depth the actors I just don’t get. As far as Kelly goes there’s a cockiness to his characters that I could see turning people off. Like I’ve been told about Leslie Howard, maybe you just haven’t hit on the right film yet. I just clicked back to your original review of An American in Paris. The movie bugs me too. I think it’s really sexist, even allowing for the attitudes of the time, and the plot is really thin, thinner than that of most musicals, even. But yes, the music, the dancing, and Kelly are great. And thanks for giving some love to Brigadoon–I’m a sucker for Lerner and Loewe musicals–and I get a kick out of Xanadu. Weird movie, but Gene Kelly shines. And who doesn’t love Singin’ in the Rain and On the Town? Summer Stock is one of my favourite Gene Kelly films. Your choices were awesome, although I must admit I’m not the biggest fan of either Brigadoon or Xanadu. Great post! I love both Singing in the Rain and Brigadoon. Gene Kelly was always one of my favourites. Not the most perfect voice, but all the more appealing because of that.